The main risks of the South Pole, apart from the general hazards of the cold, are the crevasses. As you most probably will follow the logs of previous expeditions, you don't have to worry too much about them. The major area of crevasses is just where the old and the new Antarctica meat, just by the Trans-Antarctica Mountain range, around half way to the South Pole. You could encounter black streaks of buried crevasses there, but they are harmless. Stay close to the proven longitude and you'll be fine. If in doubt you can check the snow by staking it with your ski pole. Sometimes the snow will give way under you with a thump as you ski across it. That will stop your heart for a moment, but it's just snow settling beneath your weight. 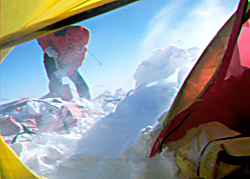 Some expeditions bring ropes for crevasse rescue. If you do, make sure you know how to perform a crevasse haul, it's not easy. Solo travelers sometimes build elaborate systems with rigid pulling handles for their sleds aimed to halt a crevasse fall. The only fatality known by us in polar travel at Antarctica is a scientist who fell into a crevasse just outside camp. But the story is a mystery still today. Much due to such factors as the team waiting for hours before actually looking for him. And longer even before calling for rescue. Other fatalities include instead a major parachuting accident over the South Pole. All guys except one came down with unopened chutes, still frozen in free fall position. The exact cause of this accident is unknown. The most probable outcome for you is that you'll do the entire trip without seeing one single crevasse. Tiny cracks in the ice, yes – but these are not crevasses. Your modern day dangers might instead include avoiding to get run over by polar vehicles, as the new Antartica highway is under way.